Children spend upwards of 30 hours per week at school and scheduling time for recess is crucial to ensuring that children can be physically active and play. Play during recess contributes to children’s physical activity levels, gives them a break from academic work, and offers a chance to improve their social skills.4 Despite these benefits, an increasing emphasis on academic achievement has resulted in more time spent in the classroom, thereby relegating recess to an afterthought in many jurisdictions.7 This development is troubling as eliminating recess can negatively affect children’s attention in the classroom.8 Time spent during recess has been found to improve grades and standardized test scores, as well as indicators of cognitive skills (i.e. : attention, concentration, and memory), and academic behaviours such as attention and the ability to remain on task.9 Even 15 minutes of recess a day can contribute to better classroom behaviour10 and empathy for peers.11 Interviews with elementary school children reveal that physical education classes do not provide children with the opportunity to organize their own games and choose peer groups.1 Recess provides one of the few forums for children to interact with their peers on their own terms12 as classroom instruction is often focused on individual learning and free play after school is diminishing. Banning, limiting or restricting children’s engagement in recess is also shown to disproportionately affect marginalized children.6 One study in the United States found that 56% of a test group of children residing in households with incomes at or below the poverty level had access to recess compared to 83% in households above the poverty line.16 The same study also showed that fewer African-American children have access to recess than non-African-American. In Canada, over 80% of schools have one or more active school policies, including recess.17 However, school yard bans on hard balls18 and rules limiting physical contact,19 including games like tag, show that we are not immune to policies limiting opportunities for free play. 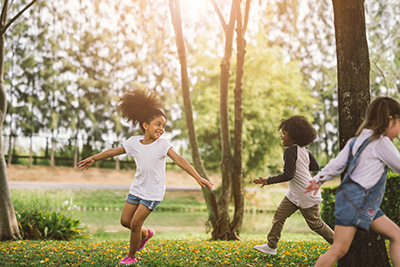 Strategies to increase outdoor play are necessary, but they need to be supported by policies that promote the physical, academic, and social benefits of recess. When recess breaks are extended, more children are engaged and play happens at a more vigorous intensity.1 Policy issues that infringe upon children’s right to play include over-supervision, extensive safety rules, and limited access to diverse equipment and play spaces.28 Interviews with children indicate the importance of teachers’ supervision, but inadequate or excessive supervision can deter active play, as can excessive safety rules that ban running or prevent the use of equipment.28 Recess policies should be addressed from a balanced approach, considering safety alongside the benefits of outdoor play. McNamara, L., 2013. What’s getting in the way of play? An analysis of the contextual factors that hinder recess in elementary school. Canadian Jounal of Action Research 14(2) 3-21. Centers for Disease Control and Prevention [CDC]. Promoting better health for young people through physical activity and sports, 2000. Murray, R., Ramstetter, C., Devore, C., Allison, M., Ancona, R., Barnett, S, Young, T. 2013. The Crucial Role of Recess in School. Pediatrics 131(1), 183–188. Hatfield, DP., Chomitz VR. Increasing Children’s Physical Activity During the School Day. Current Obesity Reports 2015;4(2):174-156. Wong, A. Why Kids Need Recess. The Atlantic. 2016. Deruy E. Learning Through Play. The Atlantic, 2016. Burris K, Burris L. Outdoor play and learning: Policy and practice. IJEPL 2011;6(8):1-2. Barros RM, Silver EJ, Stein RE. School recess and group classroom behavior. Pediatrics 2009;123(2):431-6. Texas Christian University LiiNK Project End of Year Report 2015-16, 2018. Pellegrini AD. The research debate: A disjuncture between educational policy and scientific research. American Journal of Play 2008;1(2):181–191. Hyndman B, Benson A, Teleford A. Active Play exploring the influences on children’s school playground activities. American Journal of Play 2016;8(3):325–344. McNamera, L., Lodewyk, K., and Franklin, N. 2018. Recess in elementary school: A study of belonging, affect and victimization on the playground. Children and Schools 40 (2): 114-121. McNamara, L., Vantaaja, E., Dunseith, A., and Franklin, N. 2014. Tales from the playground: transforming the context of recess through participatory action research. International Journal of Play 4(1): 49-68. Roth J, Brooks-Gunn J, Linver MR, Hofferth S. What happens during the school day? : Time diaries from a national sample of elementary school teachers. Teachers Collage Record 2003;105(3):217-343. Barnes J. The ParticipACTION Report Card on Physical Activity for Children and Youth: Are Canadian kids too tired to move? 2016;1–76. The Canadian Press. Toronto school bans hard balls. CBC, 2011. CTV News. New No-Touch Policy Introduced at B.C Elementary School, 2013. The Star. How Cold is too Cold for Recess?, 2011. Environment and Climate Change Canada. Wind Chill: The chilling facts, 2017. Halton Catholic District School Board. Administrative Procedure, 2014. Ottawa Carleton District School Board. Extreme Weather Conditions-School Protocol, ND. Ryerson Community School. Weather Guidelines, ND. Saskatoon Public Schools. Severe Weather, ND. Winnipeg School Division. Frequently Asked Questions, ND. CBC News. What’s Too Cool for School? NLTA Wants One Temperature for Winter School Closings, 2015. Tucker P, Gilliland J. The effect of season and weather on physical activity: a systematic review. Public Health 2007;121(12): 909–922. Hyndman B, Telford A, Finch CF, Benson AC. Moving Physical Activity beyond the School Classroom: A Social-Ecological Insight for Teachers of the Facilitators and Barriers to Students’ Non-Curricular Physical Activity. Australian Journal of Teacher Education 2012;37(2):1–24. Brussoni M, Gibbons R, Gray C, Ishikawa T, Sandseter EBH, Bienenstock A, Tremblay MS. What is the relationship between risky outdoor play and health in children? A systematic review. International Journal of Environmental Research and Public Health 2015;12(6):6423-6454.